Police in the Papua New Guinea city of Lae have arrested three men in connection with the death of a university student at the weekend. 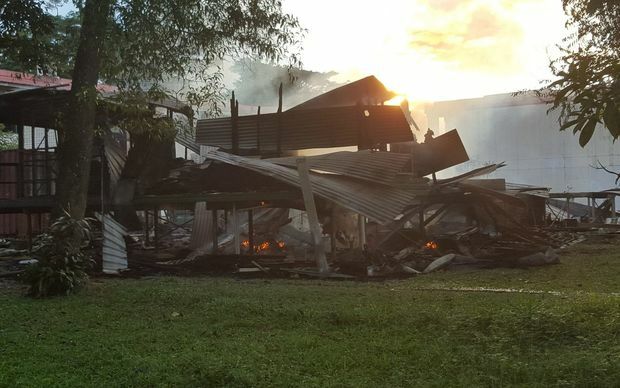 A first-year student was killed at Lae's University of Technology, or Unitech, and buildings were burned in what the university said appeared to be a targeted attack. Witnesses say a mob armed with bush knives entered the campus and killed Graham Romanong, a first year student, as he slept in his dormitory. The Lae Metropolitan Commander Anthony Wagambie has confirmed the three men have been arrested and would be questioned by police over the incident. The vice chancellor, Albert Schram said it wasn't clear what motivated the attack, but it could have been revenge for a student who was wounded in a brawl earlier in the month. Saturday's unrest came after a series of clashes at PNG's three main universities this month, including a police shooting that injured dozens of students at the University of PNG in Port Moresby three weeks ago. Students across the country have been involved in a months-long boycott of classes in protest at the Prime Minister, Peter O'Neill's refusal to stand down from office to face fraud allegations. But Mr O'Neill has blamed the parliamentary opposition for inciting the unrest, and said the opposition leader, Don Polye, had "blood on his hands." Mr O'Neill accused Mr Polye and the opposition of attempting to use student issues for political gain. He said the opposition has been stirring up students and misleading them with false ideas, and that when investigations were completed, he wouldn't be surprised to find the opposition heavily involved. Mr O'Neill said the opposition was undermining the economy and image of the nation. The Papua New Guinea cabinet was to meet today to consider the National Security Council's report on university campus violence.